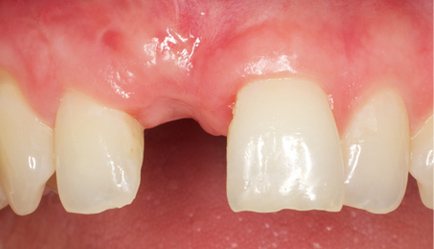 Replacing one front tooth is one of the greatest dental challenges. 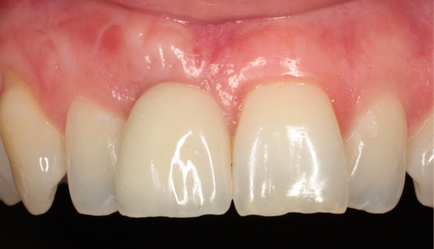 Using an implant avoids damaging the adjacent teeth or a denture, but specialised microsurgery, micro bone grafting and guided reshaping is almost always needed to recreate the gum support and natural shape. Creating a realistic artificial crown to exactly match the natural teeth involves using a computer designed implant abutment and crown in metal free all ceramic zirconium, allowing natural light to diffuse under the gum margin, just like natural teeth, avoiding a dark gum margin. Capturing the extremely intricate shape, contour, colours and layering in a beautiful natural tooth is the province of our world-class artist and technologist. A personal consultation is arranged for you: detailed photographs and the latest leading edge ceramic technology are used to create a beautiful crown, which replicates nature. If you are missing one tooth in the upper or lower jaw a crown mounted on a dental implant is the best replacement solution. The need to replace a missing tooth could be the result of an accident or because there was no predisposition for a tooth at birth. The dental implant is installed in the jawbone. No healthy teeth are affected or damaged. Unlike with other replacement solutions, the adjacent teeth don’t need to be ground down, so we maintain a natural and healthy smile. The abutment is attached to the fixed dental implant, a crown is then placed on top of the abutment, fitting perfectly at the edge of the gum.